Majority of homebuyers with school-aged children know that school districts matter when home buying. Buyers generally measure the quality of the school as a major factor in their decision making when looking to purchase a home or to live in any neighborhood. More so than affordability or convenience stands the quality of the schools because school districts matter when home buying. This holds significance when all things are considered. Convenience to the workplace is the only consideration that appears to be slightly more important. The difference between the two is such a minimal and insignificant percentage. If the quality of schools in the area isn’t really a current factor, they may be in a few years. If starting a family is not on your current radar, you may still do better to buy in a school district that takes education seriously. The best place to start- the builder and their team! Generally, they are aware of the surrounding schools, should you make the decision to buy in their neighborhood. If the community has already had some families move in, ask them! Questions about the local school system would be among those I’d ask during a door-to-door walk of the neighborhood. This would also be a good time to find out how people like their newly built home and the builder. While not the norm, knocking on doors is a fantastic way to learn. Most people are excited to take a minute to talk about their new homes. So, take a neighborhood stroll and get educated. Located on this site are pages dedicated to each school district, to assist with helping potential buyers in finding the information they need to select a school district for their child(ren). You can find course offerings, teacher/student ratios, among other morsels of information. Also, consider the distance from your new house to the school or ask yourself, can the kids walk to school? If the answer is no, where’s the bus stop? 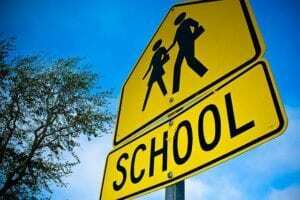 Are you able and willing to drive your kids to school each day? Most school districts, as well as each individual school, have their own websites. This is where you can find start/end times and a wealth of other information. District websites are available on the individual pages here. Know, school districts matter when home buying. There is no way around this, they should be considered. There is nothing better than taking a trip to visit the school(s) you are considering, to see first-hand how they operate. Is the school secretary friendly? Do they display their students work? Does the front office communicate with its students —how well? How are children with special needs treated? There are dozens of questions you can ask directly to the principal, depending on what’s important to you. What’s most important, when picking a school or buying a house, is that you ask enough questions, so you feel comfortable and confident that both are right for you and your family. Remember, kids tend to grow up and, in a few years, they may be off to middle school or high school. So, be sure you research and visit those schools, too, when you are making your decision.